A female Corp Member in Kaduna identified as Onyinyechi Beauty Solomon has built a 3-room Corpers’ Lodge at Government Secondary School, Fadia, Tudun Wada in Zangon Kataf Local Government in Kaduna state. Kaduna community has conferred a Chieftaincy title on her. 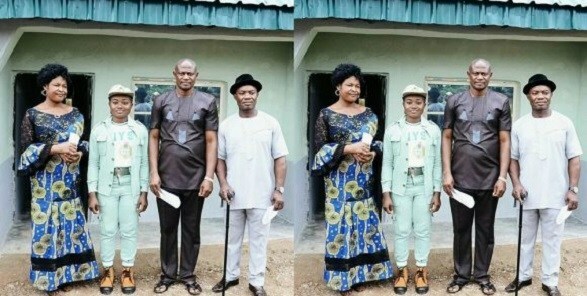 The serving corps member, who hails from Abia state, said the project was her contribution to her host community as her Community Development Service (CDS), the third cardinal point of NYSC. According to Daily Sun, in appreciation, Onyinyechi Solomon was conferred with the chieftaincy title of GIMBIYA Fadia meaning “a lady of worth in the King’s palace” by Fadia traditional council. On building the lodge, she said; “the project was my little effort to address one of the challenges that confronted my host community of service. Commissioning the landmark corps project yesterday in Zango Kataf, Coordinator of the NYSC in Kaduna, Walida Siddique Isa said, the scheme will always support excellence in all its programmes across the country.